These DTS Spurs are designed for Touring Cars and Pan Cars. 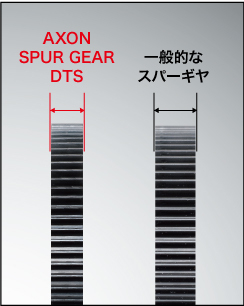 Axon Spur Gear "DTS" series, pursuing low friction at high dimensions without compromise. The gear pitch has durability and rolling feeling, and 64 pitch to demonstrate outstanding acceleration performance. The precision of materials and resin packing density, high precision, high durability, super lightweight spur gear was completed. The ball differential part was optimized along with the reduction of gear friction, achieved the best ball differential feeling which is extremely smooth and does not slip. It achieved excellent acceleration and preeminent top speed, and achieved amazing performance. 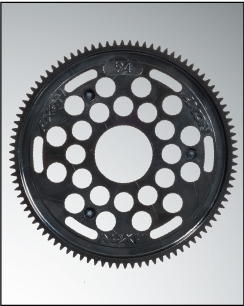 "DTS series" was designed as super light weight low friction spur gear. That gear weight of 94 gears and only 2.5 g !! In addition, it produces smooth acceleration and outstanding top speed with a high precision finish comparable to the machine cut gear which could not be formulated as a former gear so far! Moreover, the material, the shape of the whole gear was also thoroughly pursued, so durability is also outstanding! Axon optimized the ball position and the clearance of each part so that all the deflambles contact the differential plate uniformly after setting the 12 defensive balls. Completion of surprisingly smooth and ball dough with high sustainability!